Anchor: South Gyeongsang Province Governor Kim Kyoung-soo has been summoned again in an investigation into the online opinion rigging scandal involving the blogger "druking." The governor, who denied all allegations against him in the first round of questioning, urged the probe team to shed light on the case. Our Lee Bo-kyung has more. Report: South Gyeongsang Governor Kim Kyoung-soo appeared for questioning for the second time at 9:30 a.m. Thursday at the office of a probe team led by Independent Counsel Huh Ik-bum. 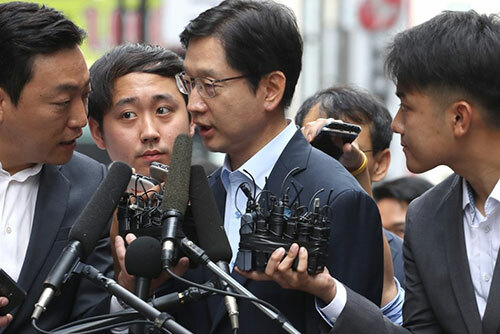 Before undergoing questioning, Kim repeated his calls for the probe team to find the truth, asking the prosecutors not to expand political conflict with the investigation but to find out what really happened. The former ruling Democratic Party(DP) lawmaker is alleged to have communicated with "druking," who led the manipulation of comments on online news stories in favor of the DP ahead of last year's presidential election. Kim is also suspected of attending the blogger's demonstration of a computer program designed to rig comments in November 2016, and offering a consulate general position in Japan to "druking" last December in exchange for seeking the blogger's support during this year's local elections. During the first round of questioning on Monday, prosecutors grilled Kim for more than 18 hours but reportedly asked him just half of their prepared questions. As the governor is strongly denying all the allegations and “druking’s” statements, prosecutors plan to question the pair together to verify their statements during the second round of investigation. The independent probe team, whose 60-day operation period is set to expire in 16 days, plans to decide on whether to seek an arrest warrant for the governor after the latest questioning. The team also plans to summon presidential secretary Song In-bae around Saturday to investigate his alleged involvement in the scandal. Prev :Research Center for Japan's Wartime Sexual Enslavement to Open Fri.